Welcome! Looking forward to a great year! 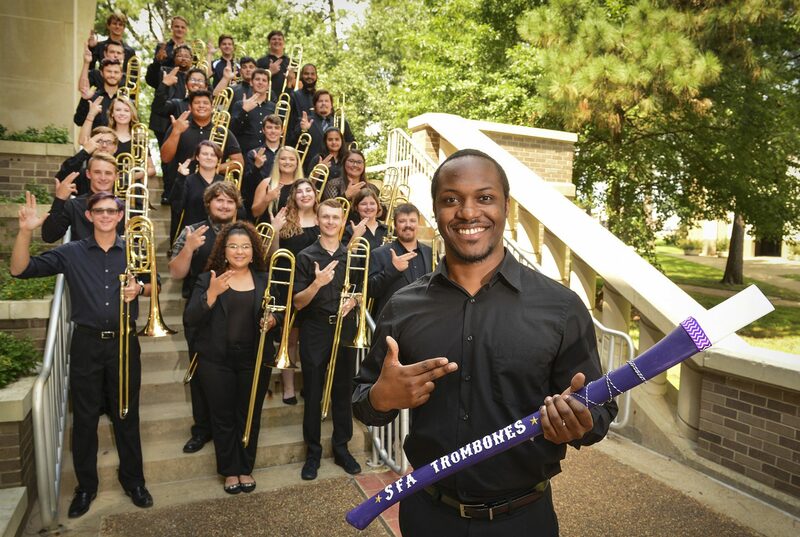 NACOGDOCHES, Texas – The Trombone Choir at Stephen F. Austin State University will celebrate International Trombone Week with a concert showcasing various music styles at 7:30 p.m. Tuesday, April 4, in Cole Concert Hall on the SFA campus. The concert will feature a combination of trombone quartets and trombone choir, according to Dr. Deb Scott, professor of trombone in the SFA School of Music and the choir’s director. The quartets will perform traditional classical music, including Anton Bruckner’s Motet: Virga Jesse, Daniel Speer’s Sonata, J.S. Bach’s Fugue in G Minor arranged by Ralph Sauer, and “In Memorium” by Raymond Premru. The trombone choir will perform an eclectic program of mostly classical music, including Fanfare for 8 Trombones by Shelley Gurin, composer from “Praise the Lord” by Handel and Hopson, arranged by Jon Bohls and Canzona for Eight Trombones by Walter S. Hartley. The group will conclude its performance with an exciting Brazilian piece called “Trombocueca,” which is a new piece of music by N. Ernesto Cortes composed for the “Trombonanza” conference in Argentina last summer where Scott was a featured artist. Marking its 15th year, International Trombone Week is an annual worldwide celebration of the trombone. Since its beginning in 2003, the observance has featured thousands of trombonists creating and participating in grassroots events and performances all over the world. The Trombone Choir at Stephen F. Austin State University will perform a recital at 7:30 p.m. Thursday, Nov. 12, in Cole Concert Hall in the Wright Music Building on the SFA campus. Directed by Dr. Deb Scott, professor of trombone, the 22-member choir will perform “Canzona XIII,” composed by Giovanni Gabrieli in the 16th century for St. Mark’s Cathedral in Venice. “This piece will feature three choirs of all trombones including the contra bass trombone, which plays in the range of the tuba,” Scott said. Two other sacred pieces that Scott described as “beautiful chorales” are on the program, including “Ave Maria” by Anton Bruckner and arranged by Douglas Yeo, and “Holy is God the Lord” by Felix Mendelssohn. The concert will also feature a piece by Dmitri Kabalevsky. “Overture to ‘Colas Breugnon’ is a lively fun piece composed originally for an opera orchestra by Kabalevsky and arranged for trombone choir by Gary Slechta,” Scott said. The recital a joint presentation of the College of Fine Arts and School of Music and is part of the Cole Performing Arts Series.